Home Blog Leasing What is The HardSoft Difference? What is The HardSoft Difference? What makes leasing from HardSoft so different from all the other leasing companies out there? We believe that it’s the holistic approach we take to our business, we care about our customers and the experience they have with us so we do our best to make sure that experience is a beneficial and helpful as possible. We also listen to our customers and try to develop new offerings that fit with what they’re looking for. For example, we have recently launched our new HardSoft Creative Club. The Creative Club gives our customers access to a pool of kit for short-term hire. That’s the kit they need when they need it for short-term projects, for just £6 per week plus VAT. The kit in the pool has a daily points value and customers receive 350 points annually to use to hire the extra kit they need and at the time when they need it. All delivered and collected as part of their membership. It’s short-term computer hire that’s cheap and flexible, exactly what many of our customers have been asking for. We have also launched a Loyalty Rewards Scheme. 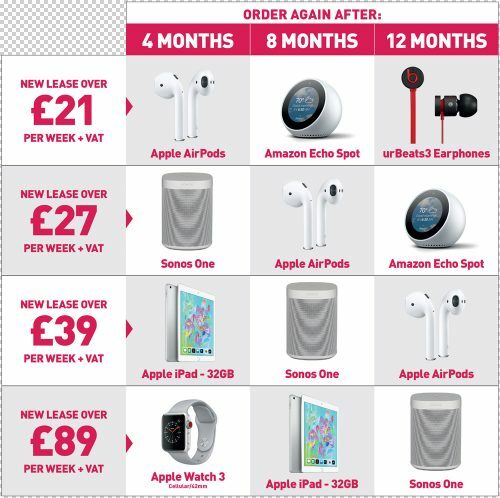 To say thank you to our returning customers for their continued business with HardSoft, and to show how much we value it we now have a Loyalty Reward Program and now offer these customers a free gift with new leases – see the gift grid. We have been trading since 1984 and our team know the nuts and bolts of leasing and can help with your financing choice. We have over 4,000 customers who hold £30M of leases. We have the knowledge and experience that comes from supporting these customers which will help us to help you. Being FCA authorised means you can be confident that all our leases fall within FCA lending criteria and have transparent terms. We work directly with Apple and all of our Apple products are genuine and brand new. We recently approved leasing for a Start-Up without an indemnity every day for a 90 day period – and counting! Created by Feefo, the Gold Trusted Service Award is awarded to businesses that meet the high standard. This accreditation is based purely on reviews of interactions with verified customers. As all reviews are verified as genuine, the accreditation is a true reflection of a business’ commitment to outstanding service. 10,000 Macs have been supplied to our customers, getting them started or keeping them going, without the need to outlay large amounts from their cash flow. If you don’t want the option to cancel your lease or change your equipment after 2-years, you can take out a Pure-Rental lease. We offer a range of lease terms to suit your needs, making it easier and more flexible for you. Insuring computer equipment can be expensive and some insurers won’t even quote on high ticket items. HardSoft offer insurance that is cheaper than you might think. If you have a Flexi-Lease you have the option to cancel your lease after two years, or change your equipment to the latest spec and take out a new lease. Our technicians are all highly trained and receive the latest, most up to date training from Apple meaning they solve any issues you may have quickly and get you back up and running as soon as possible. HardSoft believes in offering a little bit more to our customers to help them get the best from their leasing. If you’d like to discuss your leasing options with one of our knowledgeable team give us a call on 020 7111 1643 or email sales@hardsoft.co.uk. You can also use our live web chat service via our website homepage.